A lunch or dinner salad ready in 10 minutes. 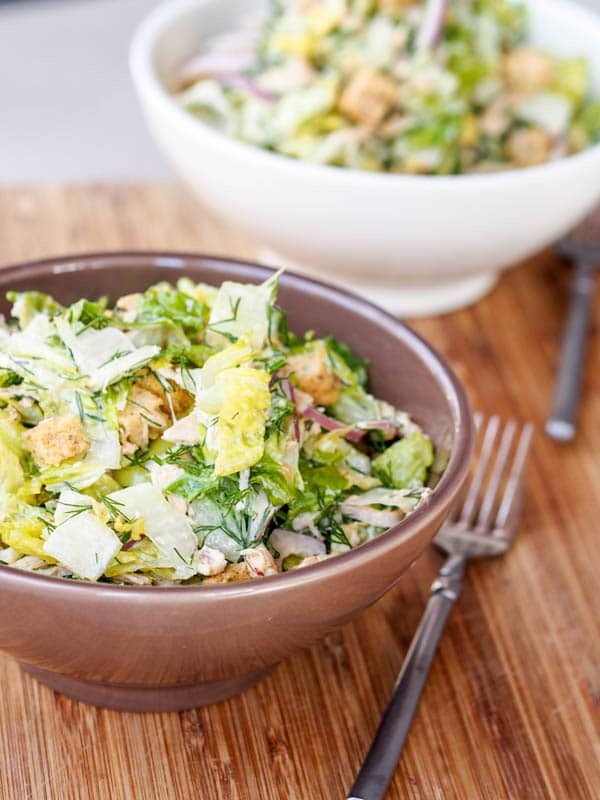 This gluten-free and dairy-free chicken romaine salad with croutons is light, crispy, crunchy, spicy and loaded with fresh dill flavors. First off Happy Mother’s Day!! To all the mothers, grandmother, great-grandmothers, out there I hope you are having a wonderful day filled with family and friends. I got to Florida a few days ago to visit friends so I’m not spending Mother’s Day with my parents this year, but I am thinking of them. Today’s chicken romaine salad recipe is actually not my creation – but one that my mom came up with. My grandmother, mother and I all love to cook. Our cooking styles are different and there are certain things we do better than others in the kitchen but we always loved trading recipes and cooking tips. Just like my broiled oysters with spicy mayo and panko, and my secret to the most tender rotisserie chicken you could dream of, this is a recipe shared with me by my mom. In standard Russian fashion there is dill and mayonnaise in this chicken romaine salad recipe. Now I’m not going as far as to say that literally all Russians bow down to dill and mayonnaise but I do find those two ingredients more prominent in Russian cuisine than in any other. My parents love both. As do I.
I know some people can’t stand dill. I mean I get it – it’s got a pretty characteristic taste unlike that of other herbs so if it rubs you the wrong way that’s ok.
And mayonnaise? I know, I know so many mayo haters out there. So fatty, so bad for you, so rich, this and that. At it’s core mayo is just eggs and oil, and I love both of those, so double the love for the mayo from me. As I’ve probably shared about a thousand times on this love, I seriously love mayonnaise. It kind of works with everything in my mind. Fish, poultry and meat marinade/tenderizer? Yup. I’ve haven’t quite found a way to sneak mayo into my drinks, but don’t worry in time I will. (Just kidding, well maybe). Then there’s Sriracha – another family fave. Not exactly classic Russian, but has acquired a soft spot in my heart. So spicy, so good on also just about anything. On that same old sandwich, chicken, fish, salad dressing. When whisked together with mayo those two are quite a pair. That leads us to this awesome crispy crunchy fresh chicken romaine salad. My mom first made this for me sans chicken, but the second time around we added in some leftover boiled chicken from making home made chicken broth and I thought it was a nice hearty addition. For the dressing, you guessed it – Sriracha and mayo. For the other ingredients just toss together sliced romaine, thinly sliced red onions, chopped fresh aromatic dill, and tender shredded chicken. For additional crunch top with gluten free croutons. A full on lunch or dinner meal that comes together in under 10 minutes. 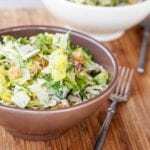 This chicken romaine salad is perfect for these hot spring days when you should be spending all your free time outside and not stuck in the kitchen cooking up a storm and making the house even hotter. For this Mother’s Day try this chicken romaine salad and give your mother a big kiss! A lunch or dinner salad ready in 10 minutes. 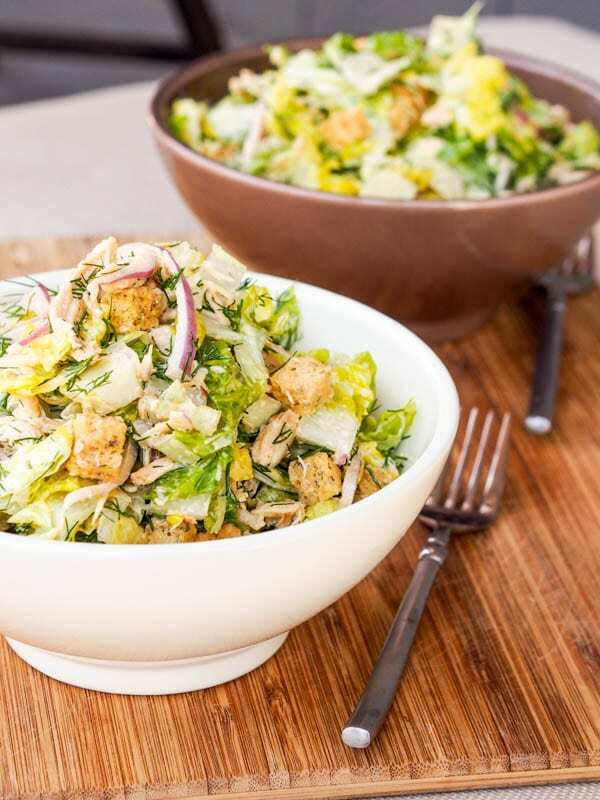 This gluten-free and dairy-free chicken romaine salad croutons is light, crispy, crunchy, spicy and loaded with fresh dill flavors. In a large bowl combine romaine, chicken, red onion, and dill. Add salt/pepper to taste. In a small bowl combine mayo and sriracha until smooth. Top salad with dressing and mix until thoroughly incorporated. Sprinkle with croutons on top.